Lisa & Derek | Love It or List It Galleries | Merit Kitchens Ltd.
Jillian’s biggest hurdle was creating an improved layout and functional living space for Derek and Lisa. 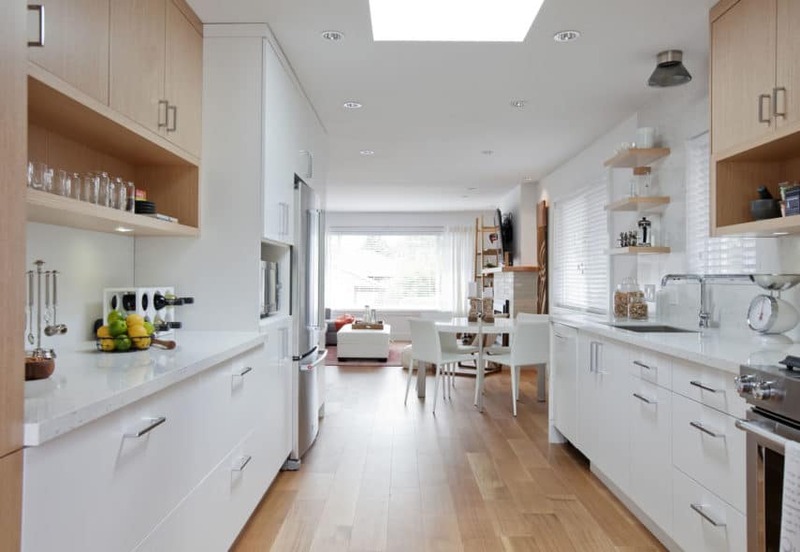 Often considered small, one-cook spaces, this galley kitchen defies expectations. It is open, bright and features ample work space for two. The Metropolitan White Oak cabinets add warmth and texture to this contemporary, white Merit kitchen. Double-thick cubbies and floating shelves provide interest and variety, as well as an opportunity to display. Finally, large, deep drawers offer easily accessible storage.